We’re seeing more and more companies investing in content marketing, and that’s a great thing. Many of them, however, are putting less thought than they should into the specific goals behind the content they produce. In today’s Whiteboard Friday, Rand covers examples of goals for targeting different kinds of people, from those who merely stumbled upon your site to those who are strongly considering becoming customers. Howdy, Moz fans, and welcome to another edition of Whiteboard Friday. This week we’re going to chat about being intentional about the content investments that you make. Now this is particularly important because otherwise it can lead to doom. I got to organize the Foundry CEO Summit last week in Boulder, Colorado. I’m not sure when you are watching this. It might be several weeks ago now. But in any case, I’m talking with a bunch of CEOs and we have a number of discussion topics. One of the discussion topics, which was my personal favorite, one of the ones I was moderating was the top of funnel customer acquisition. So I’m talking with a lot of these CEOs, B2B and B2C CEOs, about their content marketing efforts. Virtually everyone is investing in content marketing or thinking about it, which is awesome because it is very powerful. But many of them are investing in it somewhat unintentionally, or they haven’t talked with their CMOs and their marketing teams about precisely what that content is. So we pulled up a couple of blogs from some of the participants. 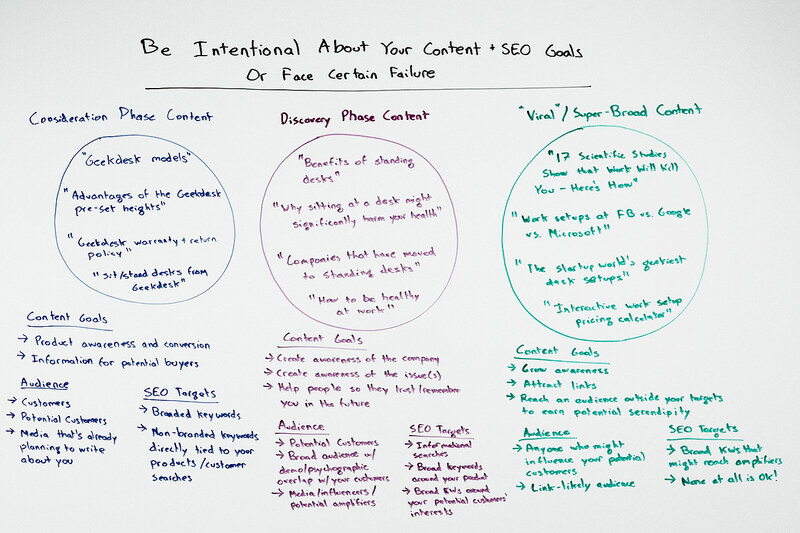 I’m kind of looking through like, “I’m not sure that there’s a strategic initiative behind all of the content that’s being produced.” That can be hugely helpful, and that’s true both for the content side of it and for the SEO side of it. Many of the folks who are watching Whiteboard Friday undoubtedly are really deep into the tactics and the SEO side. So this video is for your managers, for your bosses, for you to help them understand how to choose content investments and what to expect from different kinds of investments. Let me show you what I mean. Different kinds of content exist to target people at different sections of their experience with your site: at the consideration phase, where they’re close to buying, this is really for people who are thinking about buying your product; at the discovery phase for people who are just learning about your product or company; and at the viral or super broad content phase, where you’re not even necessarily trying to attract an audience that might buy from you, you’re doing other kinds of things. So I’m going to try and walk through each of these. I’m actually going to start with the one that’s closest to the conversion process or the conversion point in that process. So let’s imagine that I’m going to be the marketer at GeekDesk. GeekDesk sells these great sit-stand desks. I have one at home. I have one here at Moz. I love them to death because I stand up and work. I have sciatica in my left leg that I’ve had for many years, and I’ve been trying to work on that. One of the things I did is switch to a sit-stand desk. I actually almost never put it in sit mode anymore. I’m standing all the time. But in any case, GeekDesk makes great ones, ones that I really like. So if I’m working at GeekDesk, my consideration phase content might be things like the models page, the models of all the different GeekDesks that I can buy. It might be a page on the advantages of the GeekDesk preset heights. GeekDesk has these little settings. I can push one, two, three, four, and it’ll go to different heights. I have one at home where I can push it to two, and it will go to the height for Geraldine so she can work at my desk. Then I press one, and it goes to my height. Then I press three, I haven’t pre-programmed three or four yet. But in any case, maybe if Elijah comes over, I’ll set one for you. It might be “GeekDesk warranty and return policy,” or “sit-stand desks from GeekDesk.” These are kind of product-centric things. My content goals here are product awareness and conversion. I’m trying to get people to know about the products that I offer and to convert them to buyers. This is really about information for those potential buyers. So my audience, naturally, is going to be customers, potential customers, and maybe also some media that’s already planning to write about me, which is why I want to have things like great photography and probably some testimonial quotes and all that kind of stuff. The SEO targets for these types of pages are going to be my branded keywords — certainly things like “GeekDesk” and “GeekDesk desks” and whatever the models that I’ve got are — and then non-branded keywords that are directly, exactly tied to the products that my customers are going to perform when they search. These are things like sit-stand desks or adjustable height desks. That’s what this stuff is targeting. This is very classic, very old-school kind of SEO and almost not even in the realm really of content marketing. These are just kind of product-focused pages. You should have plenty of these on your site, but they don’t always have overlap with these other things, and this is where I think the challenge comes into play. Discovery phase content is really different. This is content like benefits of standing desks. That’s a little broader than GeekDesk. That’s kind of weird. Why would I write about that instead of benefits of GeekDesk? Well, I’m trying to attract a bigger audience. 99% of the content that you’ll ever see me present or write about is not why you should use Moz tools. That’s intentional. I don’t like promoting our stuff all that much. In fact, I’m kind of allergic to it, which has its own challenges. In any case, this is targeting an audience that I am trying to reach who will learn from me. So I might write things like why sitting at a desk might significantly harm your health or companies that have moved to standing desks. I’d have a list of them, and I have some testimonials from companies that have moved to standing desks. They don’t even have to be on my product. I’m just trying to sell more of the idea and get people engaged with things that might potentially tie to my business. How to be healthy at work, which is even broader. So these content goals are a little different. I’m trying to create awareness of the company. I just want people to know that GeekDesk exists. So if they come and they consume this content, even if they never become buyers, at least they will know and have heard of us. That’s important as well. Remember television commercial advertisers pay millions and millions of dollars just to get people to know that they exist. That’s creating those brand impressions, and after more and more brand impressions, especially over a given time frame, you are more likely to know that brand, more likely to trust them, conversion rates go up, all those kinds of things. I’m also trying to create awareness of the issues. I sometimes don’t even care if you remember that that great piece of content about how to be healthy at work came from GeekDesk. All I care is that you remember that standing at work is probably healthier for you than sitting. That’s what I hope to spread. That’s the virality that I hope to create there. I want to help people so that they trust, remember, and know me in the future. These are the goals around discovery phase content. That audience can be potential customers, but there’s probably a much broader audience with demographic or psychographic overlap with my customers. That can be a group that’s tremendously larger, and some small percentage of them might someday be customers or customer targets. This is probably also people like media, influencers, and potential amplifiers. This may be a secondary piece, but certainly I hope to reach some of those. The SEO targets are going to be the informational searches that these types of folks will perform and broad keywords around my products. This is not my personal products, but any of the types of products that I offer. This also includes broad keywords around my customers’ interests. That might be “health at work,” that might be “health at home,” that might be broadly dealing with issues like the leg issue that I’ve got, like sciatica stuff. It can be much broader than just what my product helps solve. Then there’s a third one. These two I think get conflated more than anything else. This is more the viral, super broad content. This is stuff like, “Scientific studies show that work will kill you. Here’s how.” Wow. That sounds a little scary, but it also sounds like something that my aunt would post on Facebook. “Work setups at Facebook versus Google versus Microsoft.” I would probably take a look at that article. I want to see what the different photographs are and how they differ, especially if they are the same across all of them. That would surprise me. But I want to know why they have uniqueness there. “The start-up world’s geekiest desk setup.” That’s going to be visual content that’s going to be sailing across the Web. I definitely want to see that. “An interactive work setup pricing calculator.” That is super useful, very broad. When you think about the relationship of this to who’s going to be in my potential customer set, that relationship is pretty small. Let’s imagine that this is the Venn diagram of that with my actual customer base. It’s a really tiny little overlap right there. It’s a heart-shaped Venn diagram. I don’t know why that is. It’s because I love you. The content goals around this are that I want to grow that broad awareness, just like I did with my informational content. I want to attract links. So few folks, especially outside of SEOs and content marketers, really understand this. What happens here is I’m going to attract links with this broad or more viral focused content, and those links will actually help all of this content rank better. This is the rising tide of domain authority that lifts all of the ships, all of the pages on the domain and their potential ranking ability. That’s why you see folks investing in this regularly to boost up the ranking potential of these. That being said, as we’ve talked about in a previous Whiteboard Friday, Google is doing a lot more domain association and keyword level domain association. So if you do the “problems with abusing alcohol” and that happens to go viral on your site, that probably won’t actually help you rank for any of this stuff because it is completely outside the topic model of what all of these things are about. You want to be at least somewhat tangentially related in a semantic way. Finally, I want to reach an audience outside of my targets for potential serendipity. What do I mean by that? I’m talking about I want to reach someone who has no interest in sitting and standing desks, but might be an investor for me or a supplier for me or a business development partner. They might be someone who happens to tell someone who happens to tell another someone, that long line of serendipity that can happen through connections. That’s what this viral content is about. So the audience is really not just specific influencers or customers, but anyone who might influence potential customers. It’s a big, broad group. It’s not just these people in here. It’s these people who influence them and those people who influence them. It’s a big, broad group. Then I’m really looking for a link likely audience with this kind of content. I want to find people who can amplify, people who can socially share, people who can link directly through a blog, through press and media, through resources pages, that kind of stuff. That’s not what it was about. You have to create the right expectations for each kind of content in which you are going to be investing. All right everyone, I hope you’ve enjoyed this edition of Whiteboard Friday. We will see you again next week. Take care.